With soothing music and spinning animals the Sophie The Giraffe Musical Mobile assures your baby will have pleasant dreams. The Sophie The Giraffe Musical Mobile assures your baby will have pleasant dreams. Soothing music and spinning animals and soft fluffy clouds circle around popular character, Sophie the giraffe. 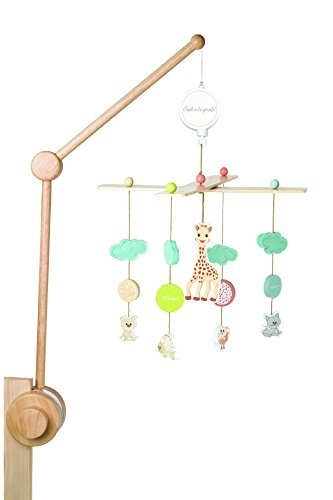 The wooden mobile attaches to a crib or playpen and stands over 2ft. high.